I’ve got a confession to make: I’ve never seen the original Snow White. In fact, I haven’t seen the majority of the animated Disney films. I’ve seen almost all of the Pixar films, but I’ve only seen four of the actual animated ones. I knew a little of the plot involving Snow White: an evil queen, a poisoned apple, and Prince Charming. The rest I had to gather from the Grimm Brothers version, which I’m guessing is rather different from the version most people have come to know and love. …what’s that? Who’s Snow White? Kristen Stewart? I’ll spare you the details if the thought of her being a film star is as horrifying to you as it is to me. If you were put off by her stoic (read: non-existent) acting in the Twilight saga, you won’t like Snow White and the Huntsman. If you can put up with her, you might find an entertaining flick with some pretty good cinematography. The film starts back in medieval times with the birth of Snow White. As she grows up as part of the royal family, her mother falls ill and eventually passes while Snow White is still a child. Heartbroken, her father, King Magnus (Noah Huntley) is forced to fight a phantom army, after which he discovers a beautiful young prisoner, Ravenna (Theron). Captivated by her beauty, he decides to forgo the whole dating thing and marries her. The night of their wedding, Ravenna kills Magnus and opens the gate to the castle, allowing her army to overpower its defenses and take over as queen. After she is victorious, she exiles Snow White to a tower for the rest of her life. Forward ten or so years, and Snow White (Stewart) is still imprisoned, looking indifferent to the world. When Ravenna is told by her magic mirror that Snow White is more beautiful than she (a total lie) and the secret to staying young and beautiful is to kill Snow White and take her soul/heart, she sends her brother Finn (Sam Spruell) to bring her to him. Naturally, since the film would be incredibly short if this were to happen, she escapes and flees into the dark forest. Enraged, Ravenna hires the best hunter/tracker around, Eric (Hemsworth), who follows her path, but instead of killing her, takes pity on her and decides to help her flee to safety, teaching her self-defense along the way, with Finn and his men in hot pursuit. Eventually, Eric and Snow White come across seven dwarf miners, who recognize the princess and also agree to help her. Meanwhile, her childhood love interest, Prince William (Sam Claflin) discovers she is alive and tracks her down to save her and rekindle the romance. After she nearly succumbs to a poisoned apple, she realizes she must rally the countryside, still loyal to her father’s memory, and strike back against Ravenna. First off, if you’re thinking this might be a fun film to take a child to and are encouraged by the PG-13 rating, be warned: this film is pretty violent. There are some squeamish moments (my friend Krisden was looking away from the screen several times, although she could just be faint of heart) that I definitely didn’t expect. If you’re ok with violence, there really isn’t anything objectionable, but if you or your child is squeamish, be warmed. The cinematography in the film is extremely well done. Several scenes of the landscape and kingdom are pretty awe-inspiring, and the production values of the film are top-notch. Having said that, though, the film itself is, well…bland. The plot strays a bit from the original, but is familiar enough that fans of Snow White won’t be lost or anything. The dialogue flows easily enough, but the delivery is pretty weak. Hemsworth does decently for the most part, but his speech to Snow White feels kinda forced and unnatural. Theron plays a pretty solid evil queen, but the parts in which she’s supposed to be intimidating and scream at others are almost comical. By far, the worst perpetrator is Stewart, who may or may not have learned her acting skills from Paul Walker. Dear lord. She can’t even make more than one face throughout the entire film. We know you have two pretty front teeth, Kristen. It’d just be nice if you were able to close your mouth for once and convey an emotion other than docile indifference. Her emotional speech to rally the people around her was less than inspiring. Let’s just say it won’t take the place of Al Pacino’s pre-game speech in Any Given Sunday any time soon. Expect to see this face, and only this face, for two hours. Maybe I’m being too harsh on her. Perhaps she can actually act, and that’s why she’s getting new opportunities, instead of her simply being a cash vehicle. I don’t see it, though. Chris Hemsworth could have carried a cardboard cutout of her, and it would have conveyed about as much emotion as she did. In her other new film, On the Road, she plays an incredibly lascivious young female, and maybe she does a better job. I won’t be checking it out, though. The film has its entertaining moments, but it also doesn’t really inspire any emotional reaction, even during the parts that are supposed to be dramatic or sad. There are, however, a few moments that literally had me thinking, “What the hell…” At one point, Snow White scares off a giant troll simply by yelling at it, and at that point, I found myself wishing I was that troll so I could walk away from her being on screen. If you’re in love with the Snow White story and can overlook the appalling acting of the main character, you may like Snow White and the Huntsman. If you have absolutely nothing to do this weekend and can’t wait another week to see Prometheus, check it out. The friends I took with me enjoyed it a little more than I did, but I walked out of the theater feeling nothing but a little anger at the world for putting me through those two hours. There are dozens of young actresses, some even with natural British accents, who could have been chosen to play the lead role. Why Kristen Stewart got the nod is beyond me. 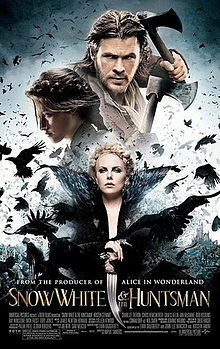 Snow White and the Huntsman gets a C-. Kristen Stewart’s performance gets a (WT)F.